In course three of the academic writing English specialization, you’ll continue learning about writing academic essays. The essays you’ll write in this course will be a little more advanced and will require you to start using outside sources in your writing. In the previous course we learned that a body paragraph should have a topic sentence. These are my own words, and this part is the quoted part, the borrowed part, and I put quotation marks around the words to show that those are not my words. This is the last name of the author that wrote these words. I used it for the third supporting idea, and again the quote is blended with my own words. I put brackets around one word because I had to change the pronoun. I needed to change the pronoun from the original source so that the grammar made sense. If you change any words inside the quote, you have put brackets around them. Any time you borrow words or ideas from another source, you have to say where you got that from. Later, we’re going to learn some other ways that you can cite your sources. Just make sure that you put the author’s last name in parentheses at the end of the sentence that has the borrowed words. You should have three supporting ideas and a couple of details or examples for each support before you have your conclusion sentence or transition sentence. One thing to remember is that we use source material to support our ideas, not to make the ideas for us. Your topic sentence is always going to be your point. After you make your point, then you can use a source to help support you. This is further down the page, and here’s where the sentence came from in the original source. Here’s the other sentence from my paragraph where I quoted something. Remember, these are my words and this is the quoted part. If we looked further down the page, here’s where the sentence came from. This is the original source, and this is the exact sentence in that source. You can see that I changed it, I changed this word here, I changed the word my to his, remember, because I needed the grammar to make sense. Notice the last name of the author is at the end of the sentence. Again it follows an okay structure, but it’s not very academic because it doesn’t use sources. If you want, you can pause the video and think about what kind of source you might use what kind of quotation you might add. You could add the quote for all three supporting ideas. If you have kind of a weak support, you probably want to use a quotation to add to that to make it stronger. Part of the sentence is my own words, the other part is the quotation. Again, I have the citation at the end of the sentence. Down here with have the second quote, so notice how it’s nicely blended with my own words. I’m making a point and I’m using words from another source to help support my point and this is the author’s last name. Remember, any time you borrow words from another source, you have to give your source. So that’s just an introduction to using sources in your writing. A five paragraph essay is really only useful for writing a couple of pages. In college classes, students are asked to write much longer essays, so a five paragraph essay won’t do. You should already know how to write this kind of paragraph. Another type of paragraph that you could use for a body paragraph is the compare contrast, where you would compare things or you would contrast things. Just like with the cause and effect paragraph, the compare contrast paragraph would have three supports with details and examples, all supporting a topic sentence. So you should start to see that these paragraph types follow the same structure that you already learned for body paragraphs. Then you should have several details and examples that are very specific and help develop the paragraph. The structure of this kind of paragraph would be maybe geographical, describing a place from left to right or from top to bottom. 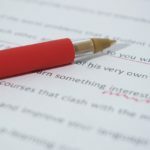 So those three types are a little bit different, but all of these types of body paragraphs can help you to write longer essays. You can use one of these types of paragraph in your argument essay to help develop your thesis statement. In a typical five paragraph essay, you would use three body paragraphs to support that thesis. If I want to write a longer essay, I can use other types of paragraphs. Well before I get to that, I might want to write a paragraph using narrative style, and I could write a narrative paragraph of background information. So that’s one way I could add a different type of paragraph to help make my essay longer. Maybe before I make my third reason, I might want to add a paragraph comparing or contrasting. Because I’m arguing for American universities having free education for everyone, I might make a paragraph that contrasts other countries who do have free college education, and who have better societies. I could show a contrast between those countries and the US. This would also help support my thesis, and it would add another body paragraph. I have my original three reasons, but I’ve added a narrative paragraph for background information, and I’ve added a comparison paragraph to show other countries and how they use free college to have a better society. So when you write your next essay, try to go beyond the traditional five paragraph essay. Every essay will be different, so you might not always be able to use a cause and effect paragraph, or a description paragraph. So think about your topic and use the kind of paragraph that is most useful for that topic.